The Sparkle Caddis is specifically designed to imitate a sedge fly pupa as it ascends towards the water’s surface to transform into the winged adult. The sparkle comes from using Antron Yarn, a lustrous man-made product that gives the finished fly a beautiful sheen. As an imitation of a sedge pupa, what sets this pattern apart is the way in which the body is tied. Its inventor, Gary LaFontaine, noticed the way the body of the real pupa sparkled due to gasses trapped within its skin and he created a two-stage body in an attempt to replicate this effect. While the underbody is applied using the standard method for dubbing fur, the overbody comprises a loose sheath of amber-coloured Antron. By tying this body cover loosely, the fibres are able to trap bubbles of air and give the pattern even more sparkle than the materials would alone. Here the pattern is tied in its ginger form but it may also be tied in brown, grey or green to mimic the colour of the specific pupa being taken. The pattern may be tied either plain or weighted with lead wire to help it sink. In the deep-fished versions, the sparkling Antron tail can be omitted. 1. 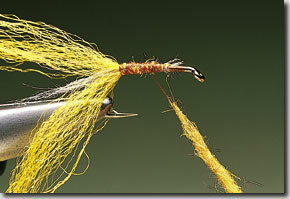 Run the tying thread down the shank to the bend. Remove a slim bunch of fibres from a strand of clear Antron yarn and catch it in at the bend to form a shuck. 2. Take a strand of yellow Sparkle Yarn or polypropylene. Divide it in half, lengthways, and catch in one half at the base of the Antron shuck, on the upper side of the hook. 3. Take the second half of the yellow yarn and catch it in at the same point but ensuring that it sits on the underside of the hook. 4. Take a pinch of amber-coloured dubbing and blend it with a pinch of ginger hare’s fur. Dub the mix on to the tying thread to form a thick, slightly tapered rope. 5. Beginning at the base of the shuck wind the dubbed fur along the shank in close turns to form the abdomen. The effect should be full and with no gaps. 6. With the abdomen in place, draw the upper section of the yellow yarn over the top. Do not pull it tight, it should be loose and envelope the top and sides of the body. 7. Repeat the process with the lower strand of yarn. Use the fingers to ease the fibres around so that they loosely enclose the abdomen. Secure the yarn with thread and remove the excess. 8. Take a pinch of natural deer hair. Ensure that all the tips are level and catch it in to form a short wing. 9. Fix the wing in place with tight thread turns then add two or three softer turns to position it low over the body. Remove the excess hair butts. 10. Take a pinch of cream fur – hare’s belly fur works well. Dub it on to the tying thread to form a thin rope. 11. Wind the dubbed fur from the base of the wing to the eye to form the thorax. Cast off the tying thread with a whip finish. 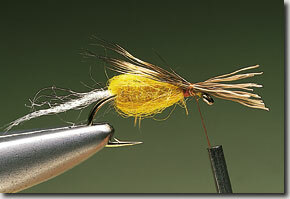 This pattern works well in any type of river that supports a good population of sedge flies. It is most productive in fast- to medium-paced runs rather than the slower pools. Works well throughout the summer months from May to September when sedge flies are hatching off in the greatest numbers. As it is early evening through into dusk when the hatch takes place, this is the time when the Sparkle Caddis is most effective. Fish it singly on a floating line. It may be fished either dead-drift, having been cast upstream. or down-and-across. When fishing down-and-across, it is advisable to use a more heavily weighted pattern to prevent it from skating. Working the rod top a little also imparts some action to the fly. When applying the overbody to this fly do not pull the two ends of yarn tight. Instead, keep them loose so that they can trap plenty of air bubbles.